Edging closer to a release? Leaks surrounding the rumored Motorola One Power smartphone are slowly increasing in frequency, and the latest leak appears to give us another look at the handset. 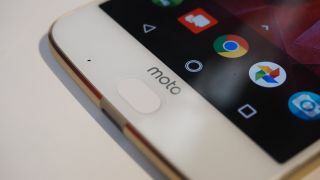 The leak consists of a number of hands on images, which TechInfoBit - who got hold of the snaps - claims show the Motorola One Power. If these images are legitimate, they appear to confirm previous reports that the handset will come with a screen notch on the front, while on the back there looks to be a vertical dual camera stack and a centralized fingerprint scanner. The images give us several different views of the phone, with power and volume keys on the right, a SIM tray on the left and a USB-C port and speaker on the base. Something we can't see here is a headphone jack, and while there's no shot of the top of the phone, we wouldn't be surprised if it doesn't feature here as Motorola has dropped the port on previous handsets.